That being said, there have been quite a few times that I thought the machine was a goner. It wasn’t! All it needed was a little bit of tender loving care. 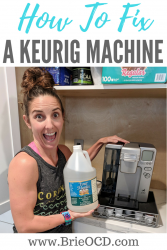 I tell you step-by step on how to troubleshoot and fix your Keurig coffee machine (any Keurig model or type). Sometimes the machine only needs minor resuscitation and not a full blown descale. Follow the steps below and keep going until the machine is brewing properly. You can watch my YouTube Video below (or by clicking here) to see the steps visually. 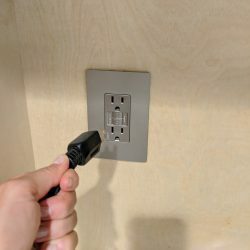 Step 1: Unplug the machine! Just like your computer, the Keurig sometimes just needs a reboot! Unplug and let it sit for a minute or two. Plug back in and see if it’s working. If it’s still not working, proceed to Step 2. Step 2: Take out K-cup and try to run with just hot water to clear it out. If it still won’t run, proceed to Step 3. Step 3: Unplug the machine. Take paperclip and clean entrance needle (see photo below). Take out K-Cup chamber and rinse that with water to remove any coffee debris. Put the K-cup chamber back in place. Take the wet rag and clean the entire K-cup area to remove any coffee grinds. Try to run the machine again with just hot water. If it’s still not brewing, proceed to Step 4. Step 4: Descale the Keurig Machine. Fill the water chamber with half white vinegar, half water. Keep brewing with hot water (NO K-Cup inserted) until the entire chamber is empty. The vinegar/water combo helps to sterilize and clear any remaining debris. 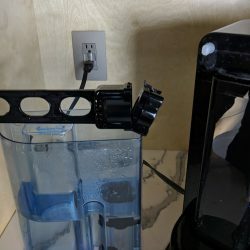 Fill entire chamber with just water. Keep brewing with hot water (NO K-Cup inserted) until the entire chamber is empty. This second cycle is to get rid of any vinegar remnants. 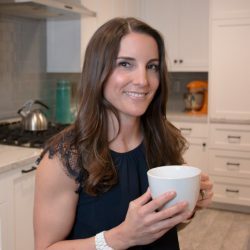 After going through all 4 steps you should be back in business and brewing your favorite coffee. If not, I suggest repeating all of the steps above for another cycle. Step 1: unplug Keurig machine. Step 2: remove k cup and brew with hot water to clear out debris. Step 3: clean entrance needle with paperclip, rinse K-cup chamber & clean any coffee debris from that area. Step 4: Descale – fill water chamber with half water, half vinegar. Brew until chamber is empty. Fill entire chamber with water and brew until completely empty. Step 5: change charcoal filter and make sure securely fastened. Step 6: Hopefully enjoy a cup of coffee! After descaling, turn the unit off and unplug for 30-60 minutes. Then plug the machine back in, turn it on. When you go to brew the descale light should turn off. If not you might have a defective unit and should then call Cuisinart customer service directly at 1-800-726-0190. It never ends! miss you more! Your tips came in handy this week! My Keurig was growling at me (literally) and taking a few minutes to brew a cup, and producing less liquid coffee than the size I requested. Cleaning the chamber and then running a full pot of just water seemed to do the trick! 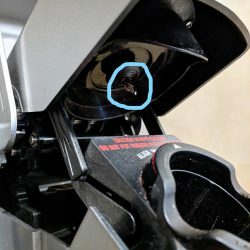 I plan to descale this weekend to give it some extra love, and it’s good to know I can use vinegar instead of paying for Keurig’s descaling liquid. 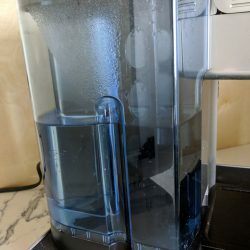 Question: should I remove the water filter before descaling? I recently put a new filter in so it doesn’t need to be replaced yet. But is it bad to run vinegar over the water filter? whohoo! Glad they were helpful! Yes, if you don’t need to change the filter I would just remove it before you descale with vinegar/water. The filter would probably hold some of the vinegar in it and no one wants vinegar coffee! I have extra filters if you ever need some! This 12 pack will last me a lifetime! You are very welcome! Glad to be of service!! Yahoo! So glad I could be of service! Enter your email if you want to stay up to date on all things Brie OCD! You can also follow me on Instagram @BrieHancy and Facebook/Youtube – Brie OCD. Hope you’re currently chugging coffee and having a great day! I have the ss10 and love it. Recently indicated i needed to descale, which I’ve done but the display is still saying descale. Any suggestions? #1. make sure that you run it with another whole tank of water so that you don’t still have vinegar remnants in there. #2. try holding down the hot water button for 6 seconds. that should reset the descale button until next time. I would love to hear if that worked for you! keep me posted! I have the SS10 and it has worked great for about 2 months. Last week we went out of town and had unplugged the machine for the duration. When we return and plugged it back it would would not work. When I pressed ‘Brew’ all that happened was a whirrrrrr, as though it were trying to pull the water from the tank but to no awaile. Attempted this multiple times with same results. Several times did get an error code on the screen of “EEO’. Please any thoughts or suggestions???! Hi there! I would try to follow all of the steps on my blog and descale the machine. If that doesnt work I would call customer service. 1-800-726-0190. You mightve just gotten a faulty machine. Starting to get mad at our SS10. Weserm to keep getting coffee grinds in our coffee.nothing worse than getting up in the morning, sitting down at kitchen table to have breakfast with your coffee on,y to get a mouth full of grinds. We have tried cleaning the needles over and over again. We have de-scaled over and over. We keep switching from one box of K-cups to another thinking the K-cups are bad. Just don’t know what else to do. We did have a Keurig 55 brand machine, in fact several of them and returned them all as they all broke. We like our SS10 but don’t know how to fix this problem. That does sound extremely frustrating! I would call customer service 800-726-0190. It sounds like the needle is too large and making too big of a puncture in the K-cup and that is allowing the grinds to get out. Hi Rosemary, are you running it with just vinegar OR half water and half vinegar? it should be a mixture of the two not just straight vinegar. I would try to run it through with just water and see if its cleared out. I have never experienced any bubbling. eeek! Uggh that stinks! Unfortunately that sounds like there is something wrong with the internal heating mechanism. You would have to call Cuisinart for that as “deep cleaning” it won’t cure that problem. Hope you get help from them and you can drink hot coffee again! I have a Cuisinart Kerrigan. The red light that indicates clean is still on after I ran 1/2 vinegar and water through twice. try holding down the hot water button for about 6 seconds. That should reset the light! let me know if it worked for you! 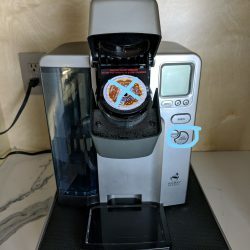 My elderly Cuisinart Keurig is acting up for the first time, the buttons are starting to stick- the on/off and sometimes the “brew” ever have this happen? Wondering if it’s time to lay it rest:( The new ones just don’t look as tough- they have a flimsy feel to them. Any recommendations for a coffee maker that compares to this one? Love the single serve option though we’d consider going back to a pot, IF they make one that brews HOT coffee. We use refillable pods, always have, with our CK. My elderly Keurig LOLOLOL! I haven’t had that happen however I would maybe try to lightly rub some mineral oil around the buttons. They had me do that with my kitchenaid attachment area and it worked like a charm! I have done all the steps twice over, include holding down the ‘hot water’ button for 6 seconds and the de-scaling light is still showing. Apart from changing the filter, I’ve just purchased the machine six months ago and only use city water; I’m not living in the country, no hard water. I suppose I could try distilled water. In any case my questions are: When should the filter be changed? What else can I do to get the de-scale light off? Hey Dan! I only change the filter when I descale (which isn’t often) but you could set yourself a reminder to change it every 3 months. To get the descale light off I would descale the machine and then unplug the unit for 30-60 minutes. After 30-60 min, plug it back in and turn it back on. When you go to brew coffee the descale light should turn off. If not, it might be a defective machine. In that case you will have to call Cuisinart customer service – 1-800-726-0190.